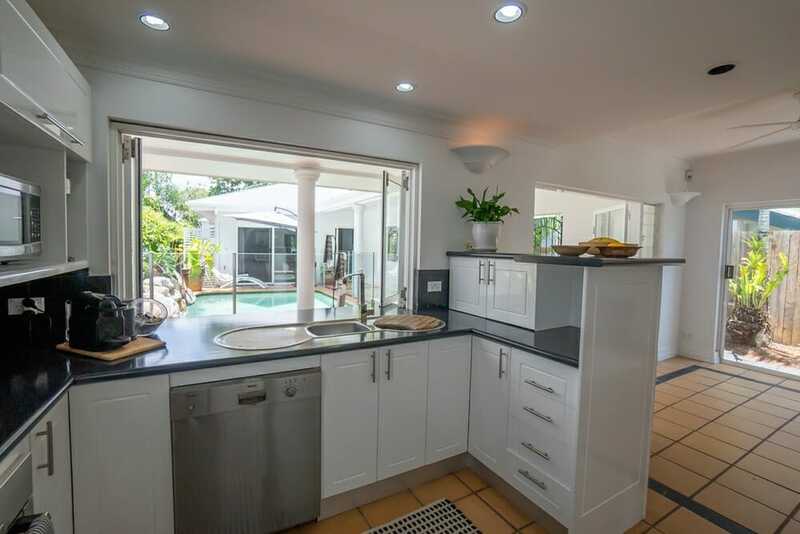 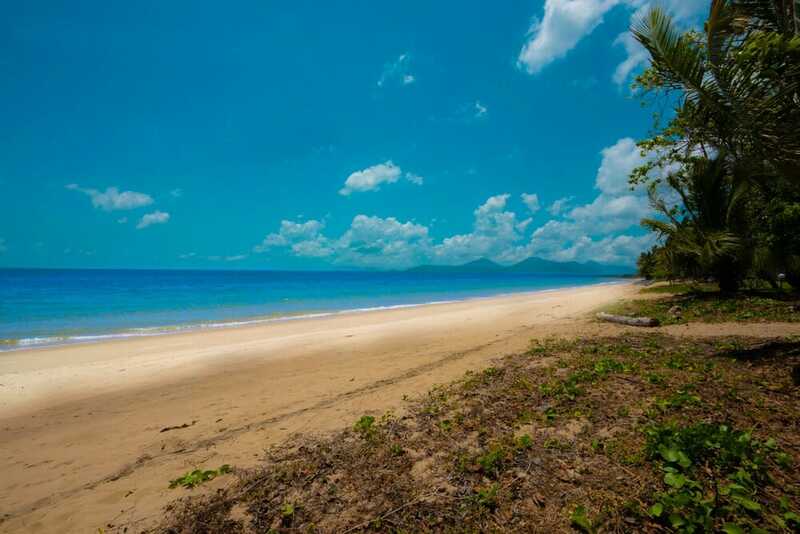 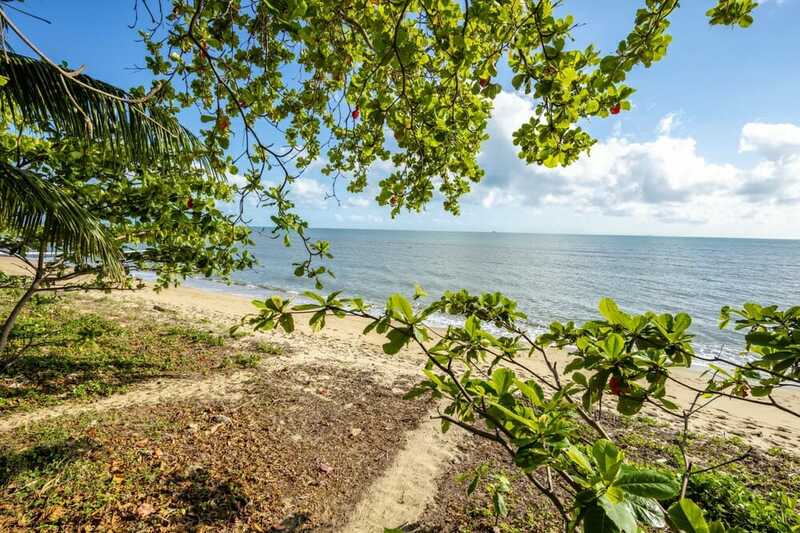 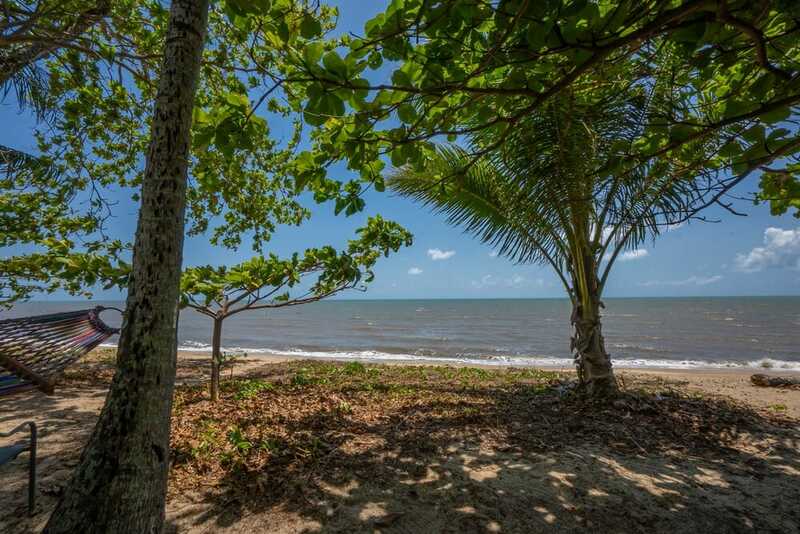 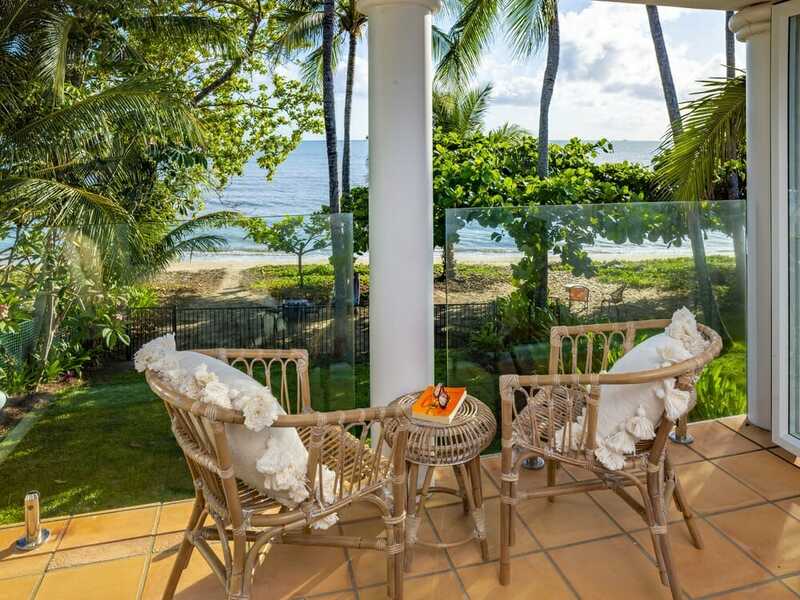 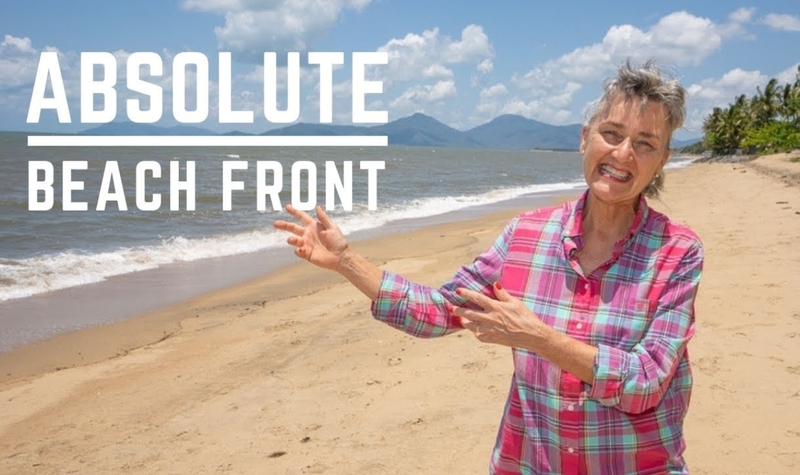 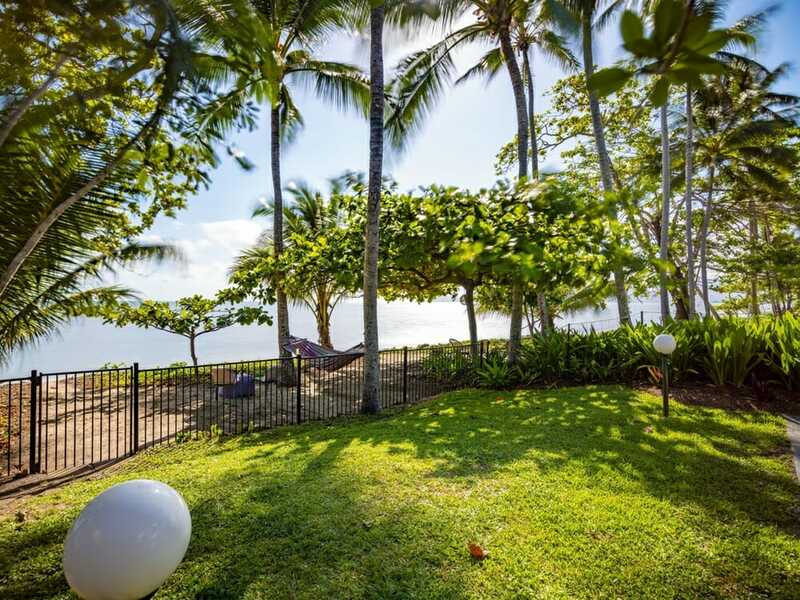 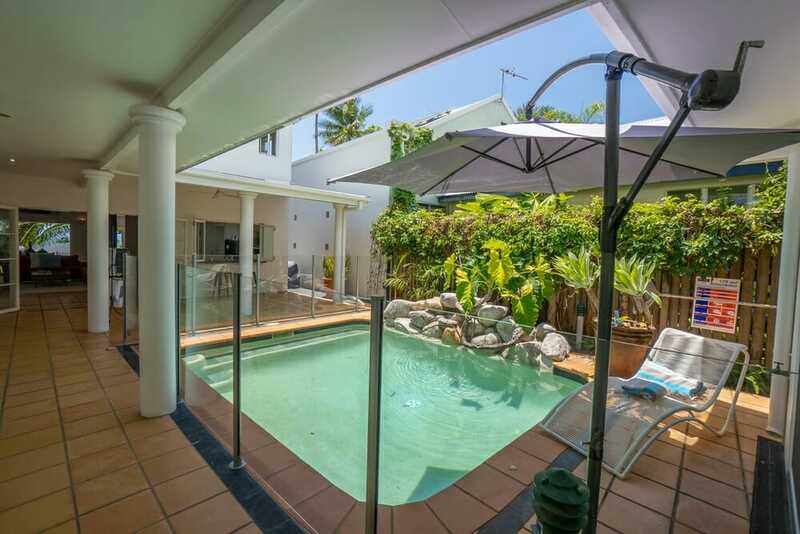 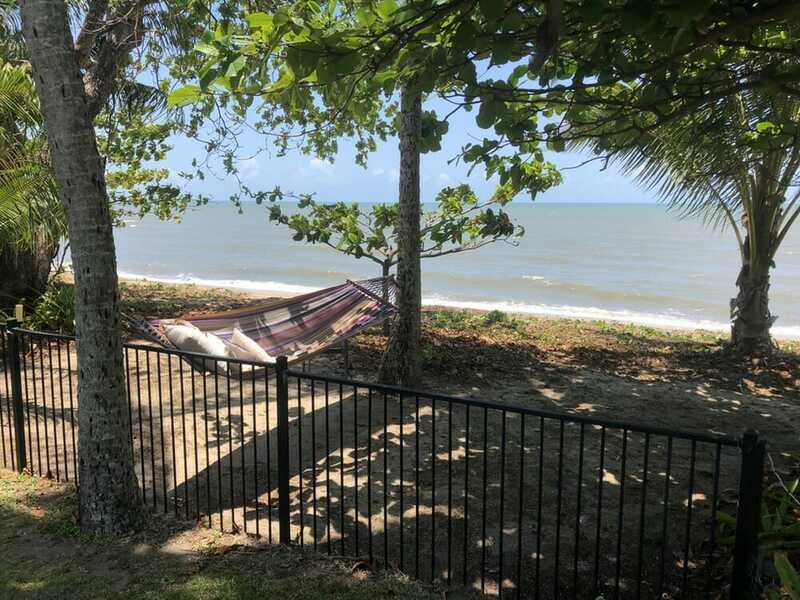 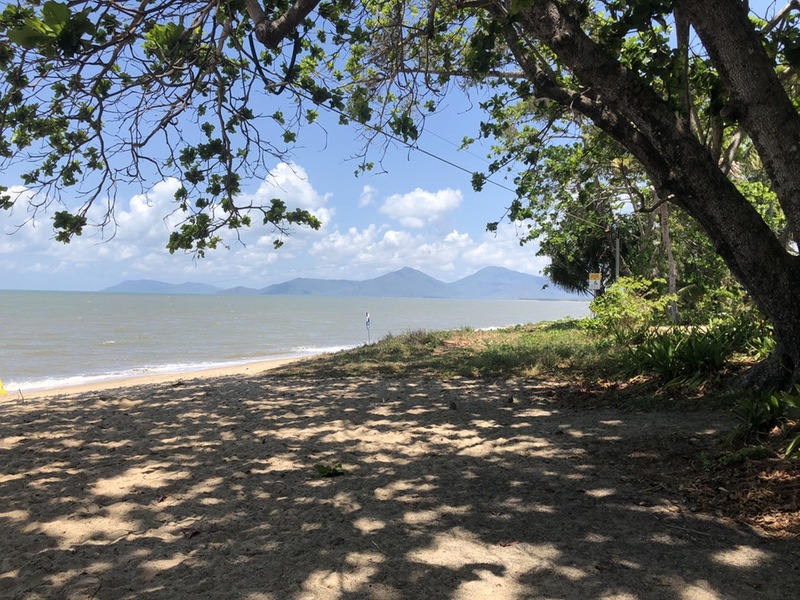 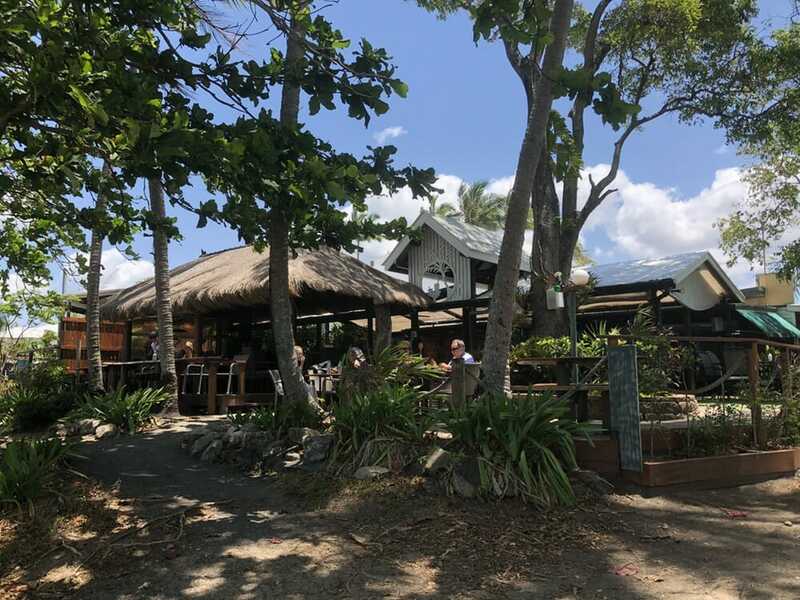 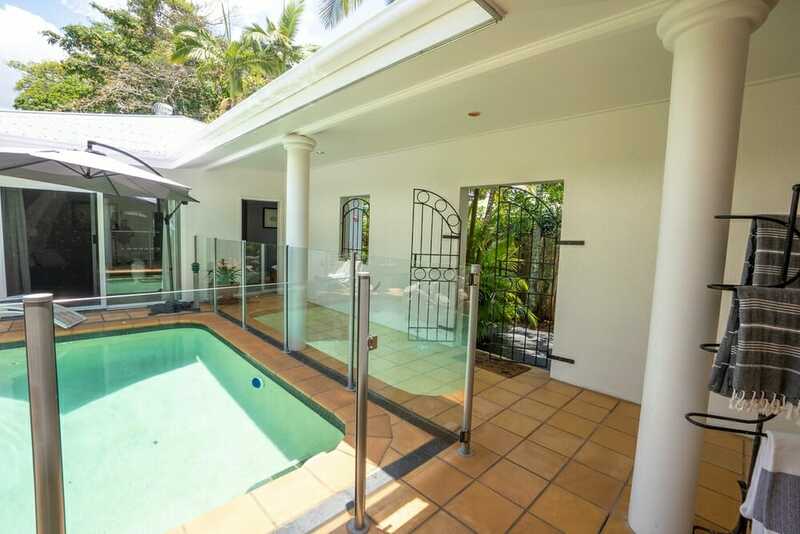 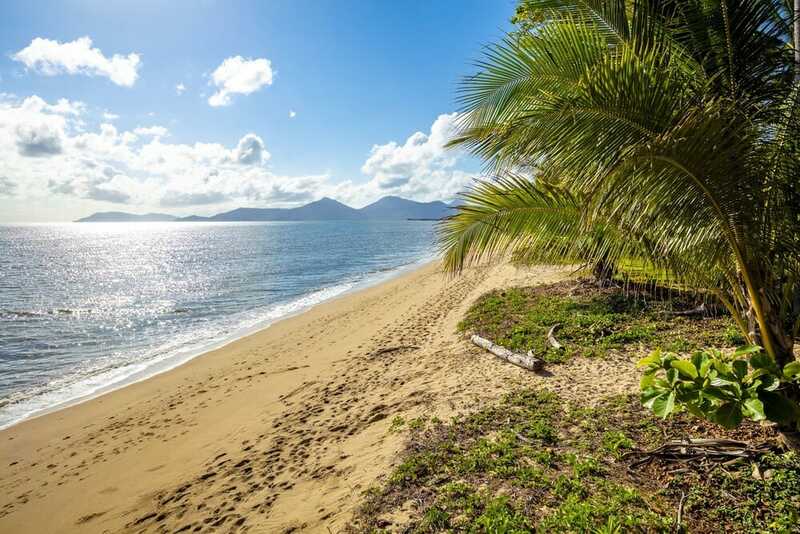 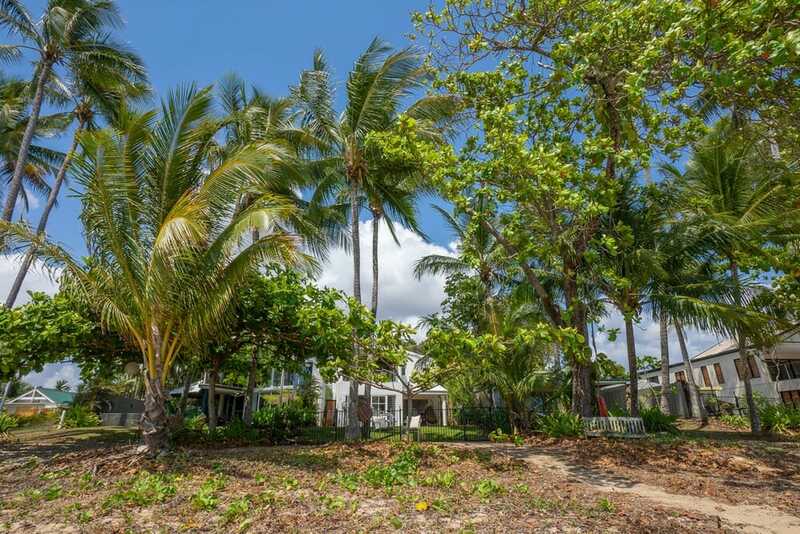 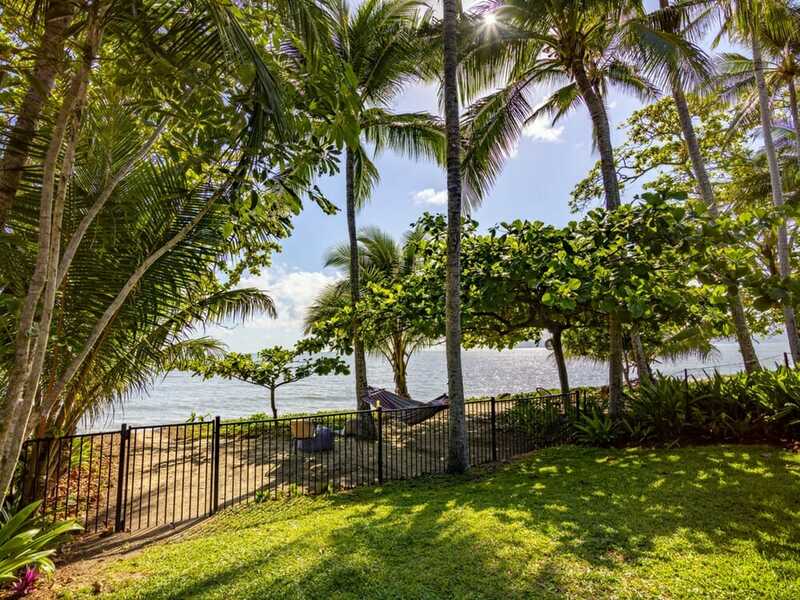 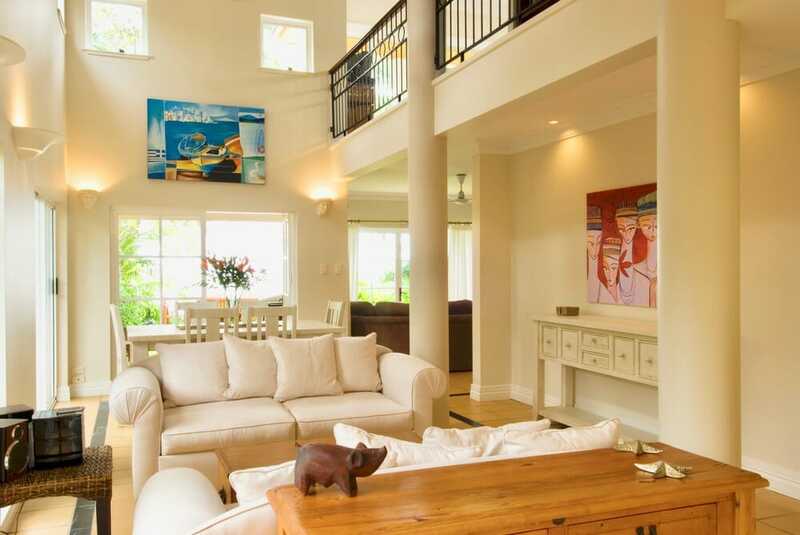 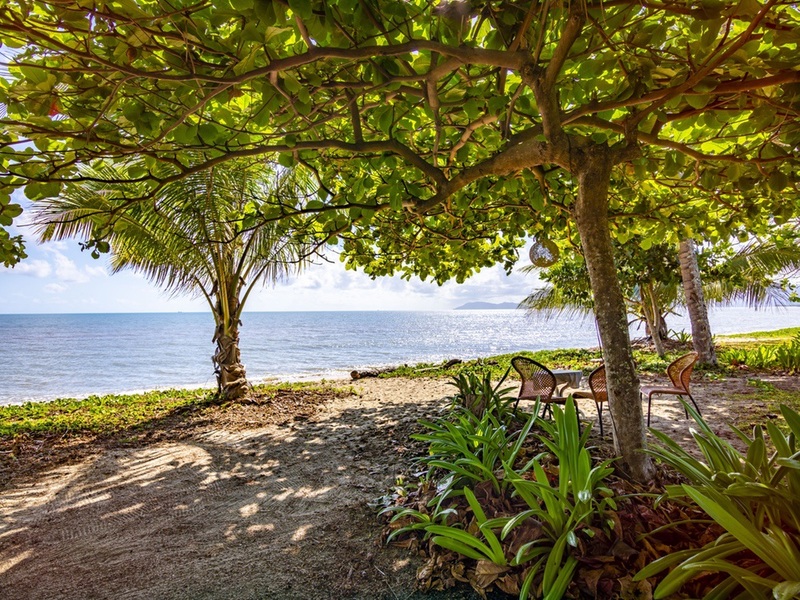 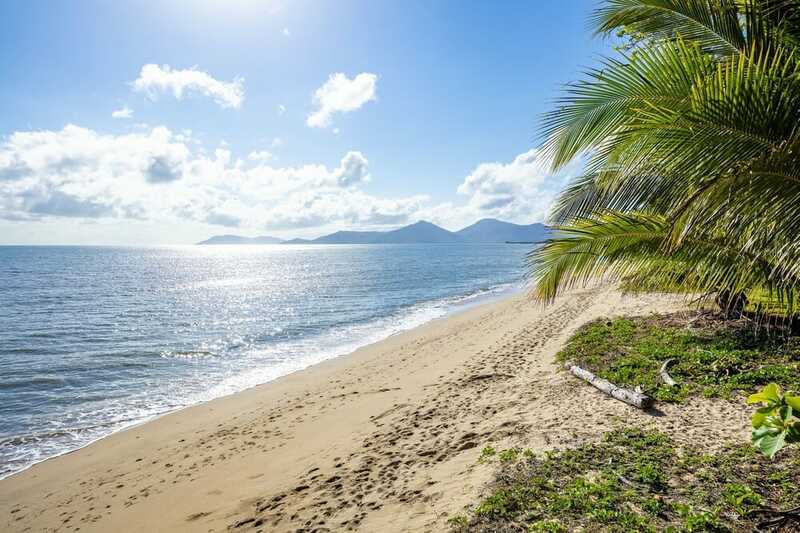 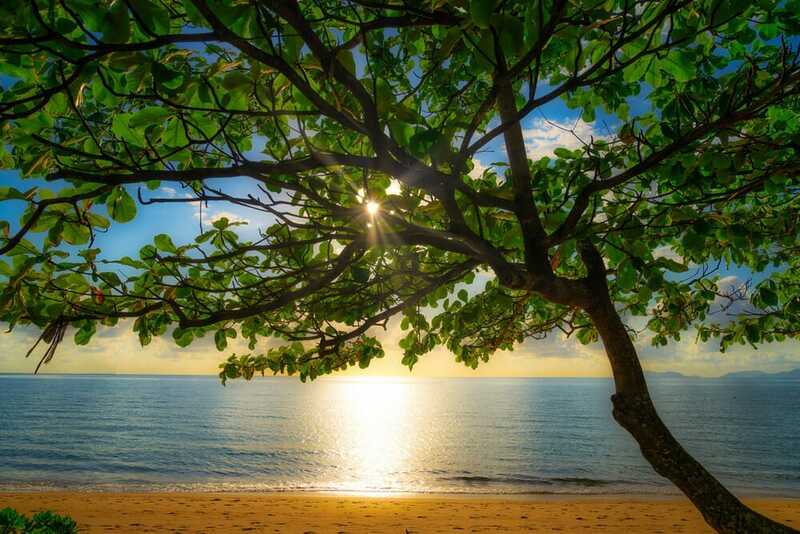 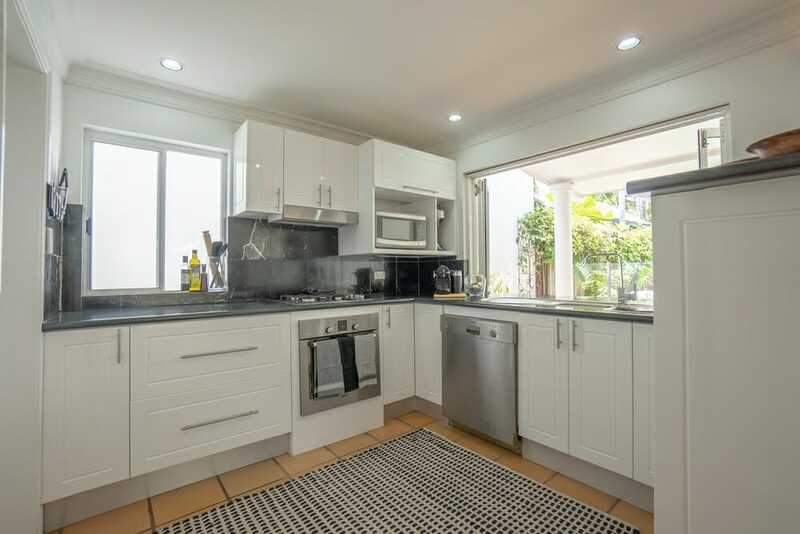 Your dream starts here…Beach side homes in the exclusive enclave of Hibiscus Lane in Cairns are rarely offered for sale. 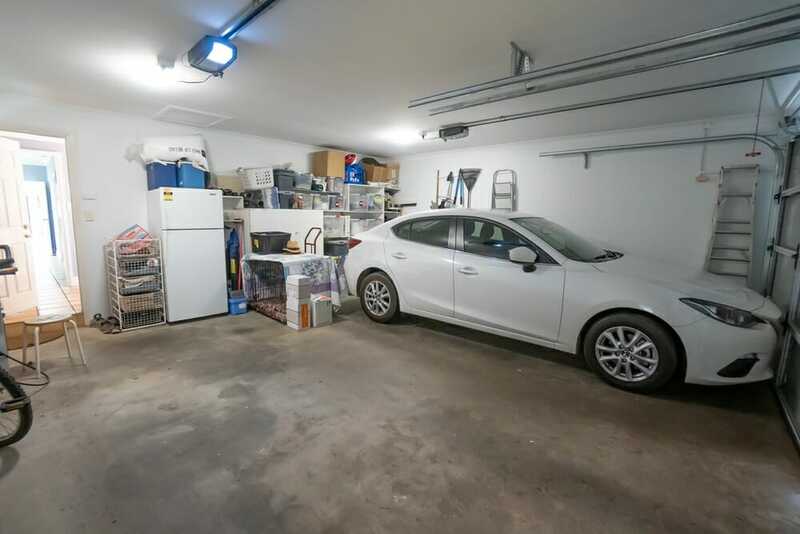 It’s available for sale today but it might not be tomorrow. 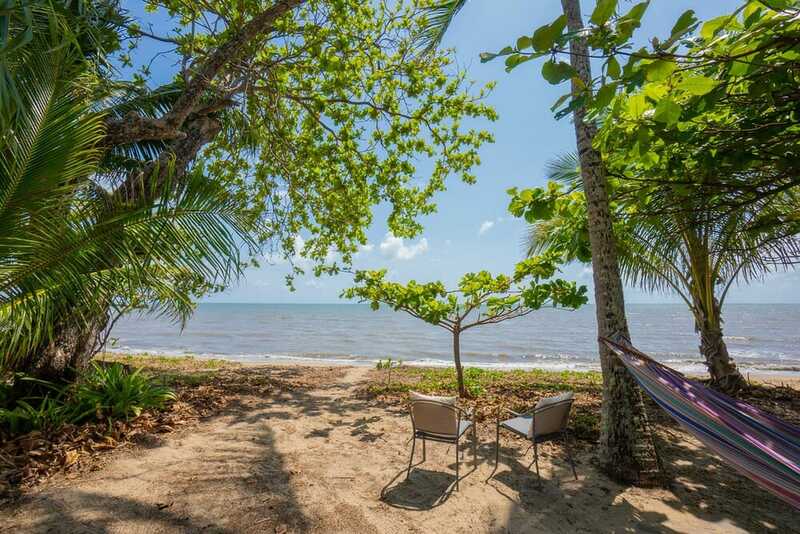 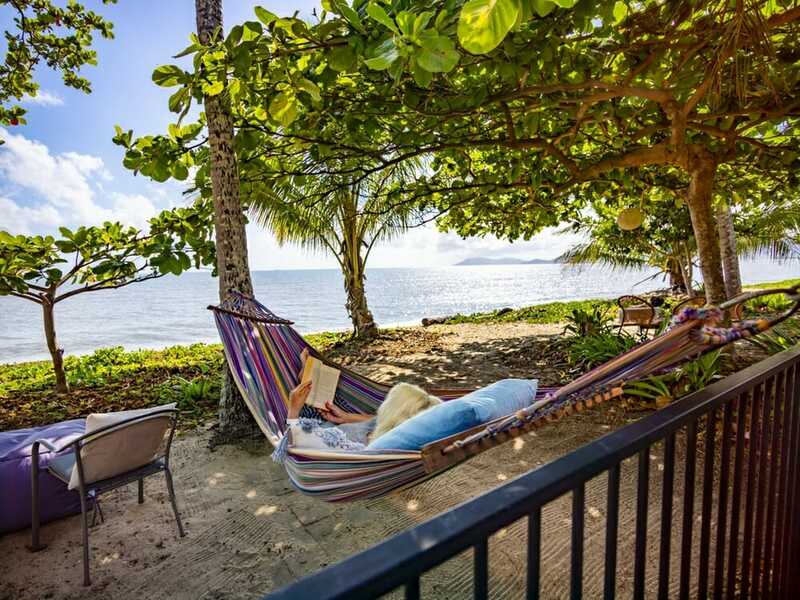 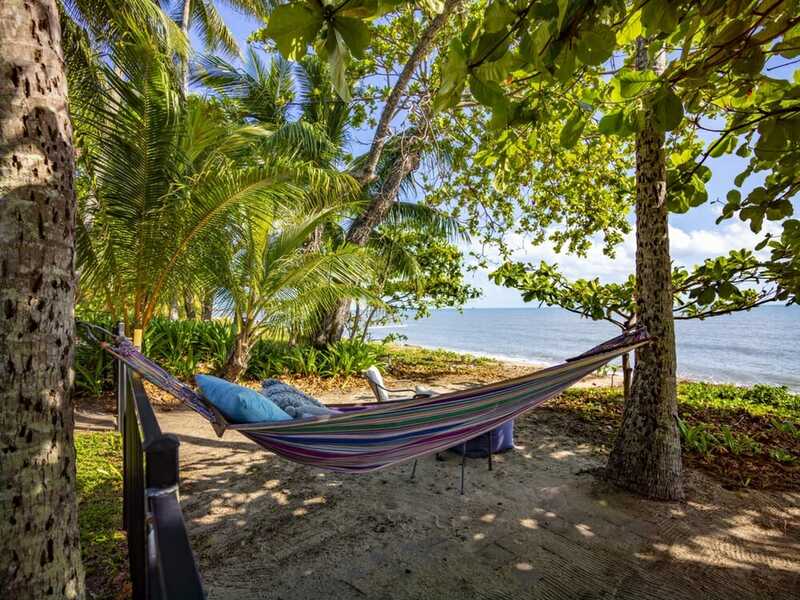 Imagine falling asleep to the sound of lapping waves, lying in bed watching spectacular sun rises and full moon panoramas or walking barefoot down the beach to the local licensed cafe on a lazy Sunday afternoon. 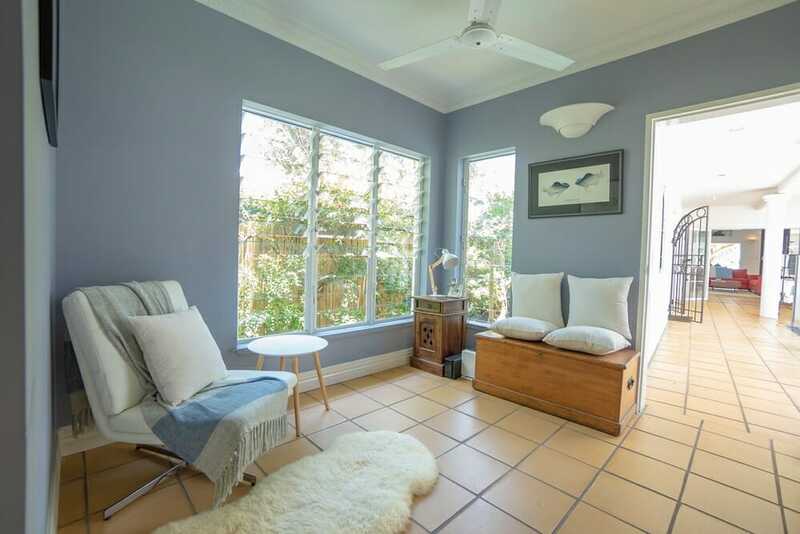 First time to market, this stylish 3-bedroom, 2-bathroom property has been lovingly cared for by the same owners who built it 25 years ago. 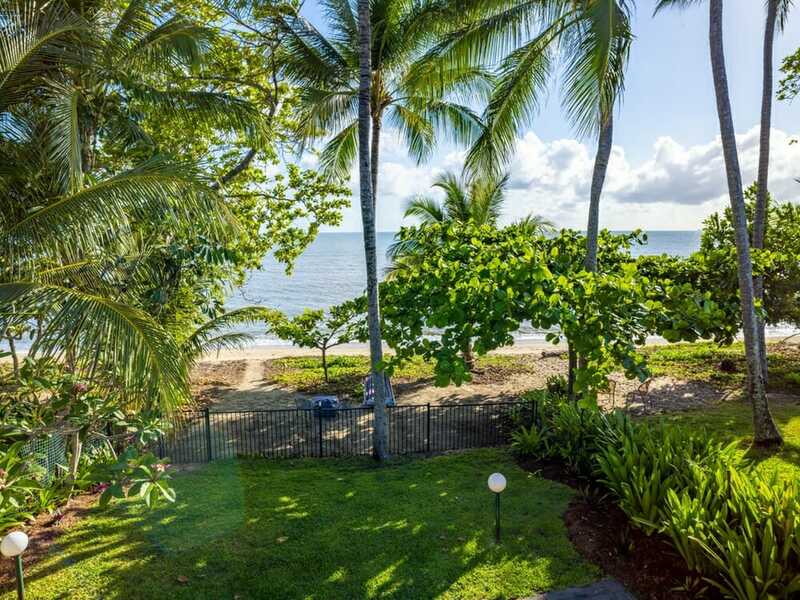 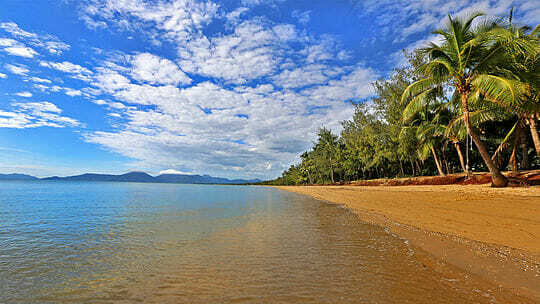 It’s so special, there’s absolutely nothing between you and a breathtaking view across the Coral Sea. 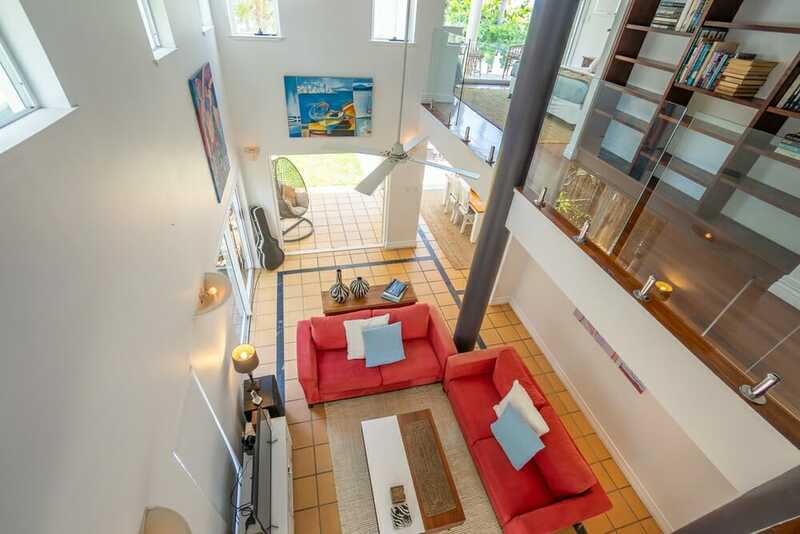 The Beach House is divided into two living pavilions, separated by a central courtyard. 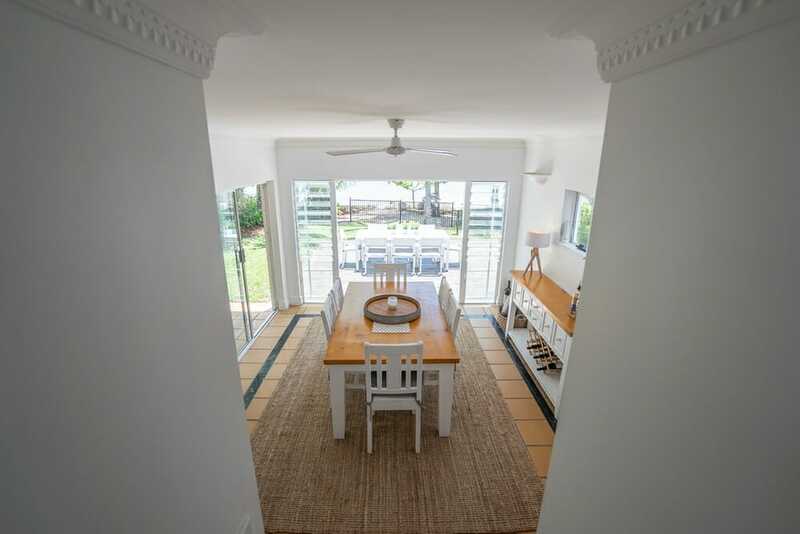 The main pavilion is home to the open plan living, kitchen and dining areas, plus separate toilet. 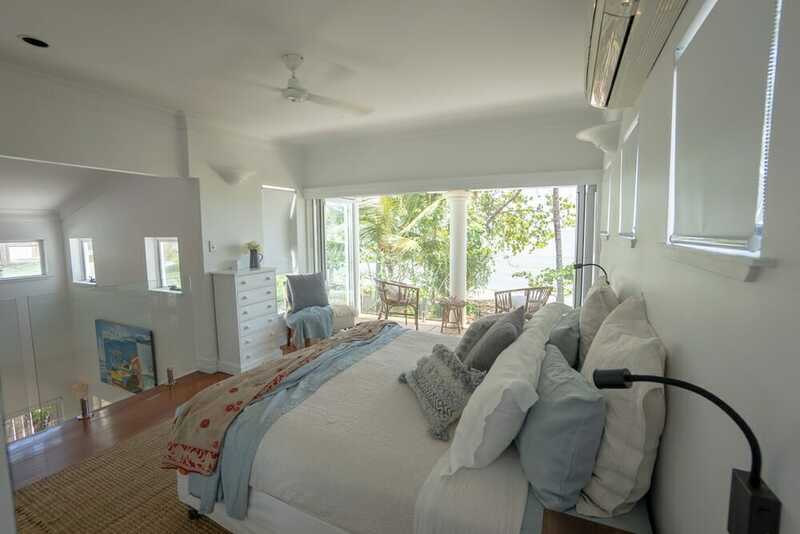 The master bedroom is upstairs on its own gallery level. 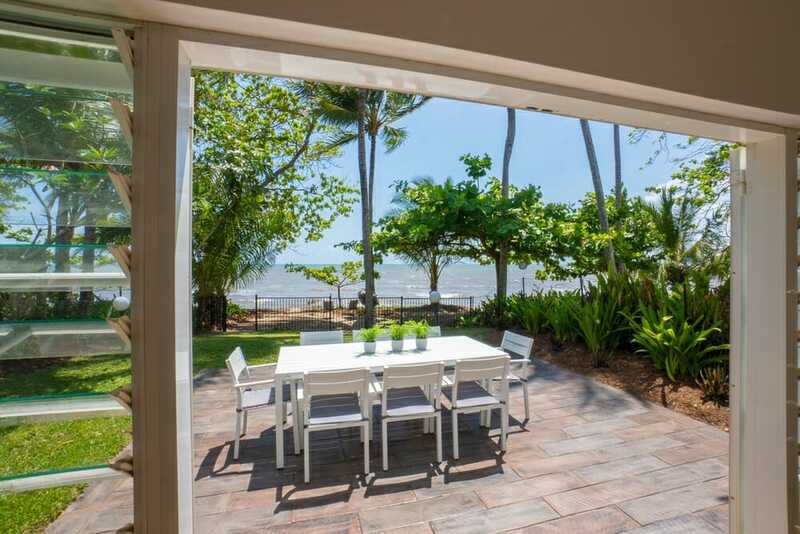 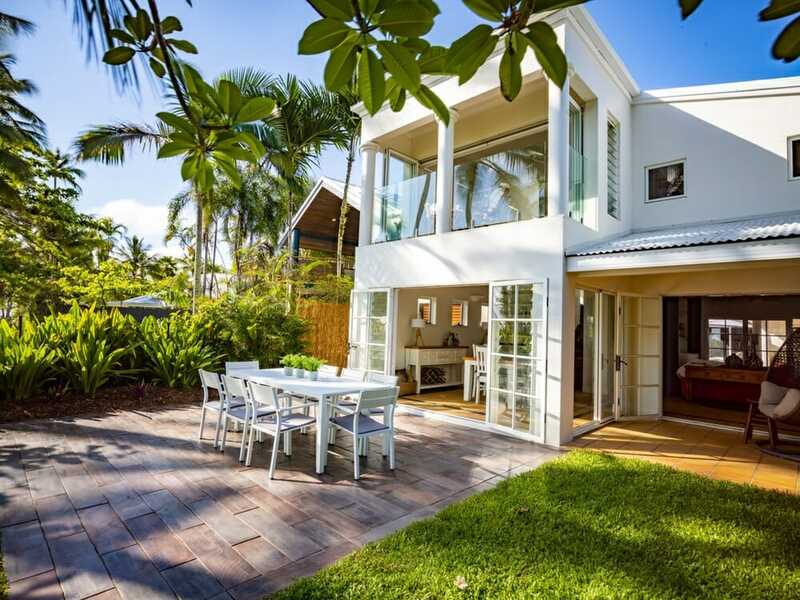 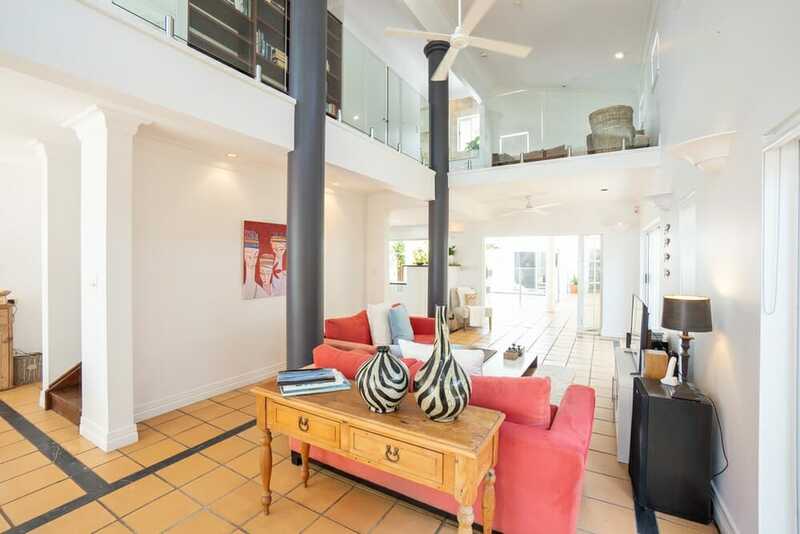 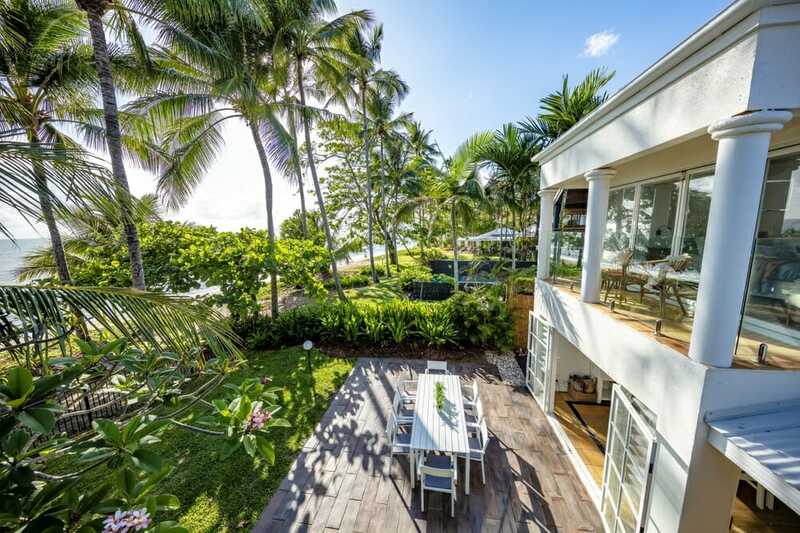 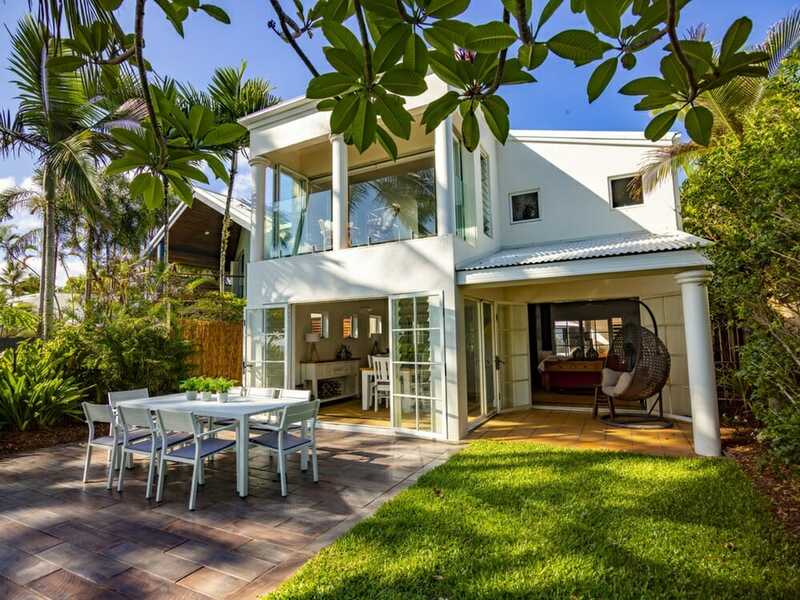 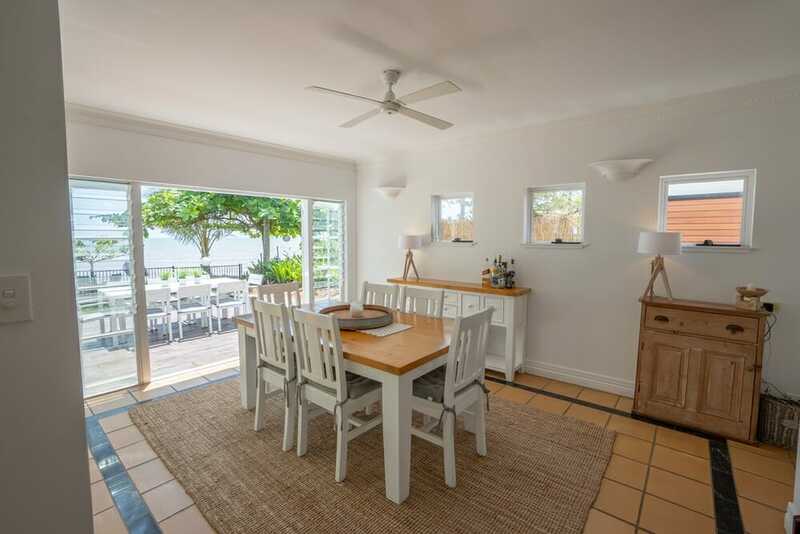 Two sets of French doors open up the living and dining areas to the garden and beach. 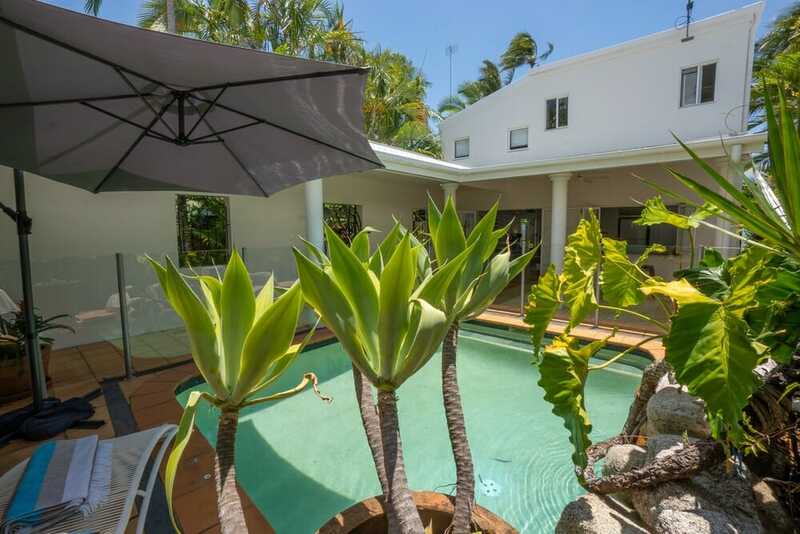 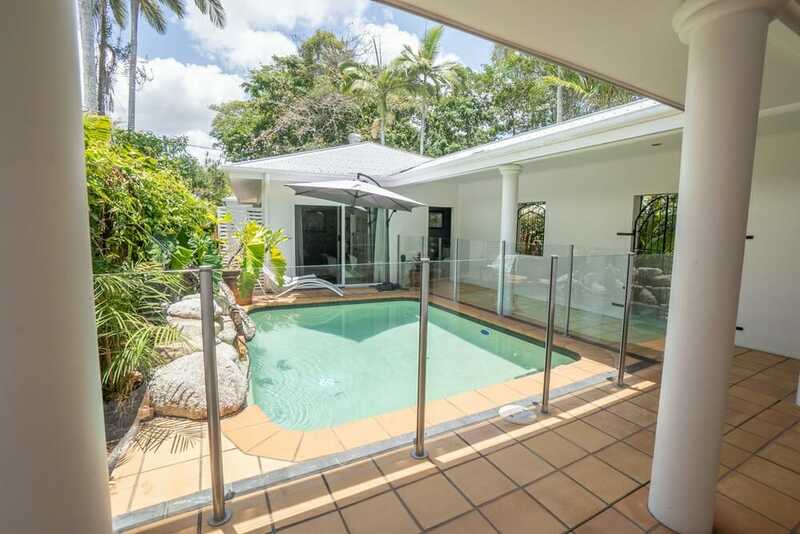 The courtyard is privately located in the middle of the house, with a shaded patio area, tropical swimming pool with its own waterfall, and covered walkway to the back pavilion. 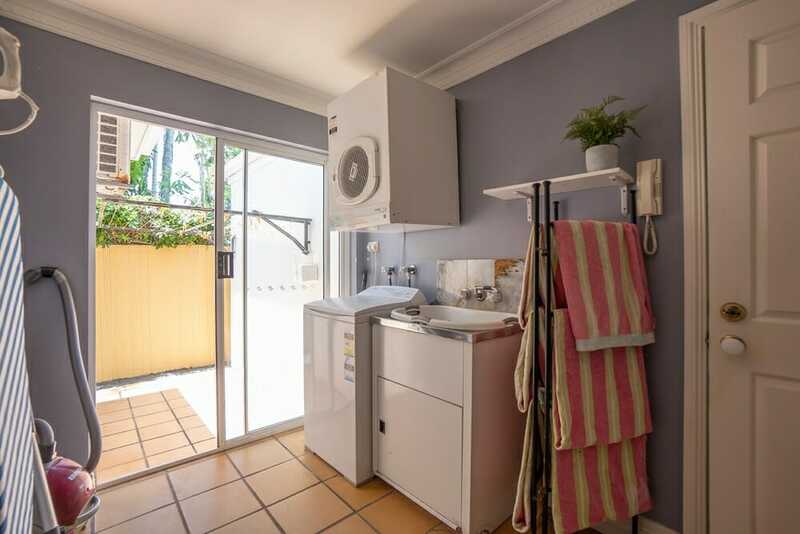 The second pavilion houses two further bedrooms, a full marble bathroom, study/reading nook and the laundry, which leads to the double lock-up garage. 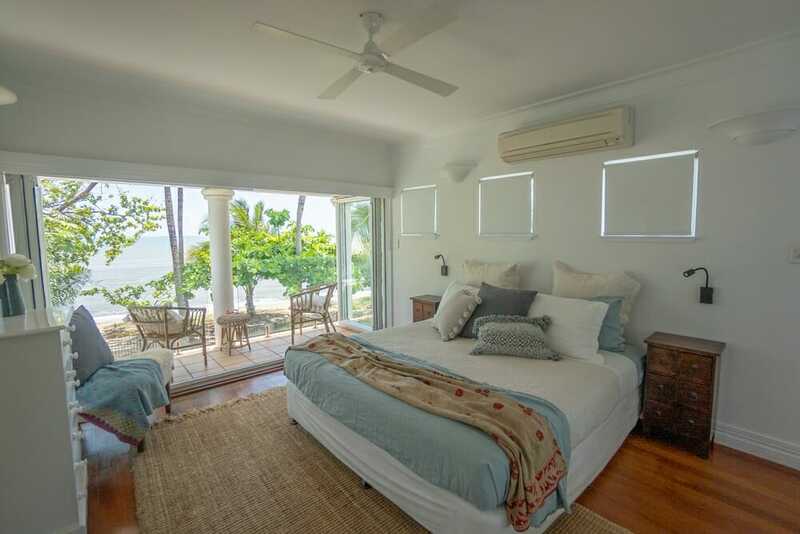 The master bedroom sits privately on its own gallery level, with warm timber flooring and sweeping views across the beach. 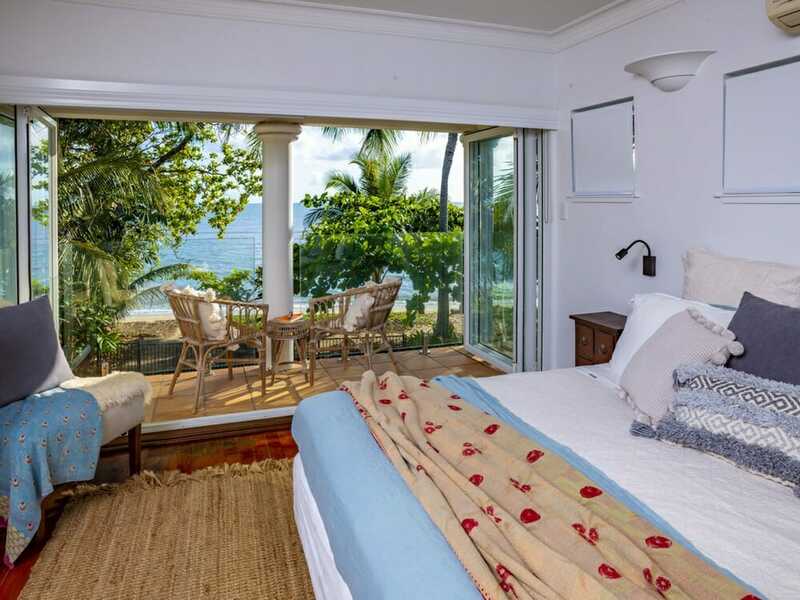 Bi-fold doors extend the bedroom out onto a generous breakfast balcony. 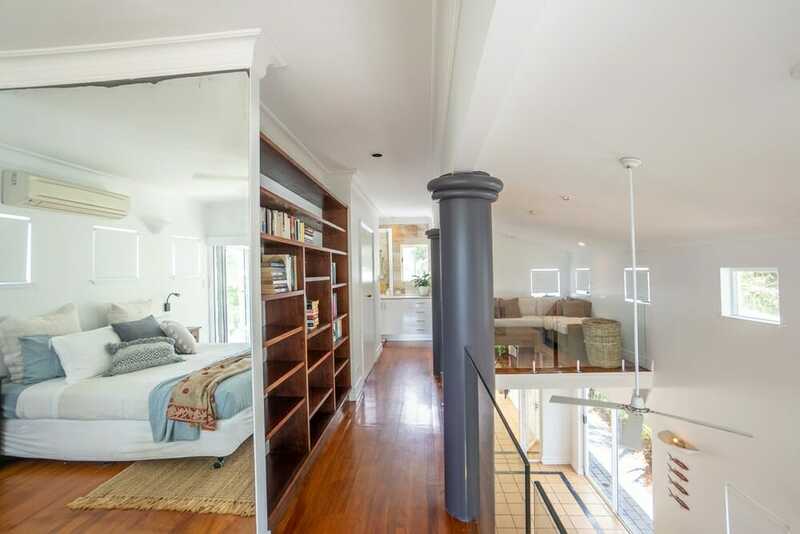 A corridor with floor to ceiling book shelves, leads to the sitting/dressing room, and cedar-lined walk-in robe. 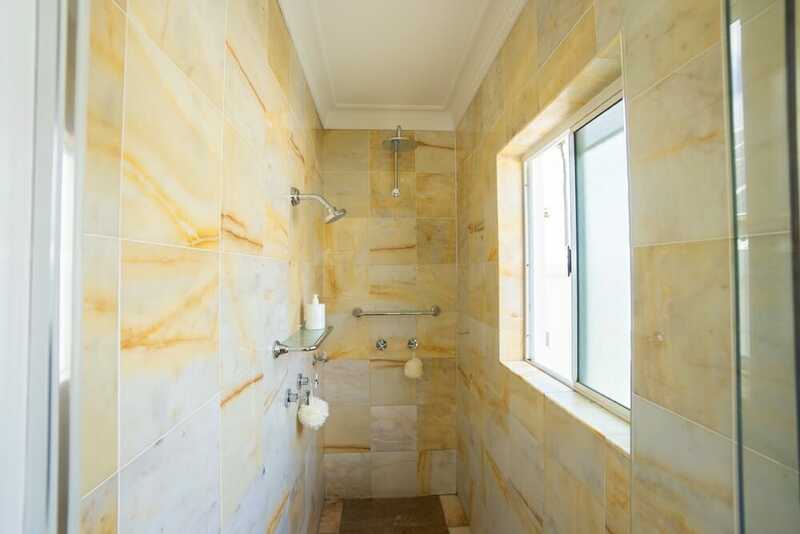 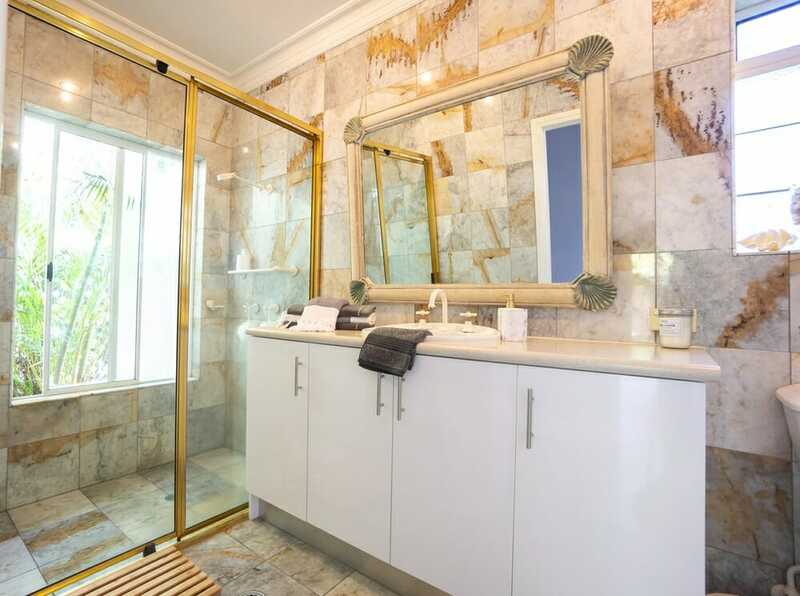 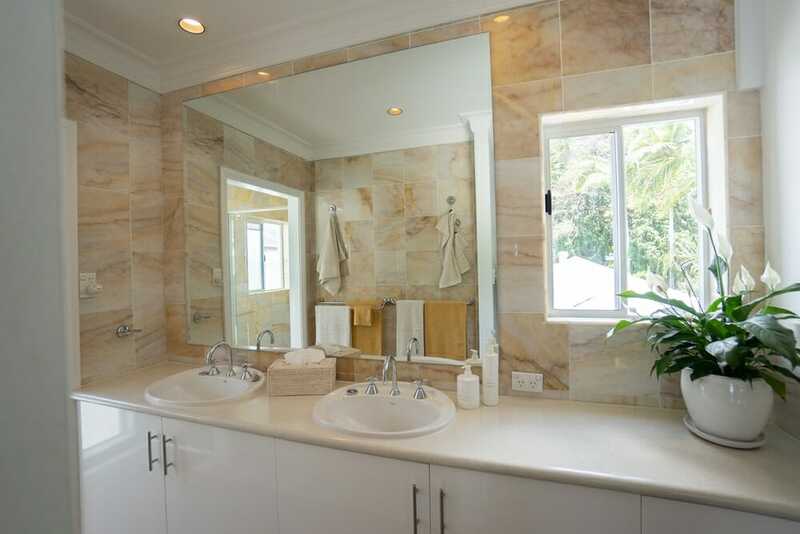 The master suite is rounded off by a stunning full marble bathroom, with its double shower recess, and two hand basins. 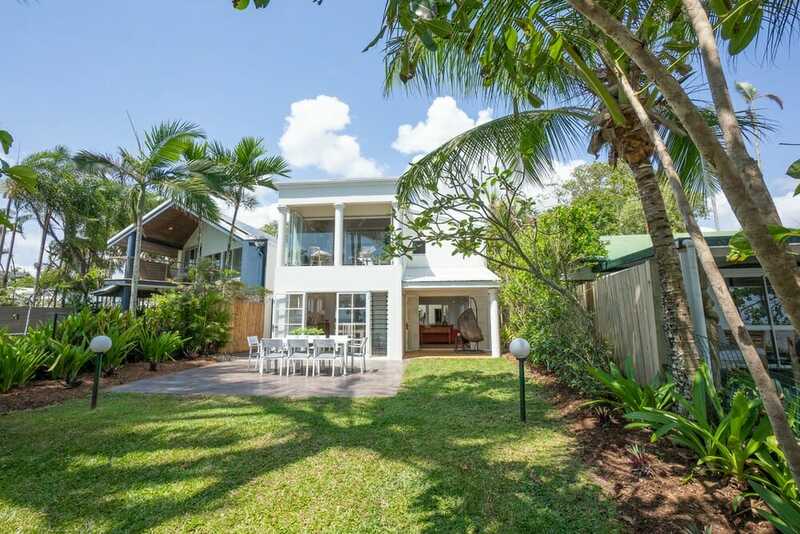 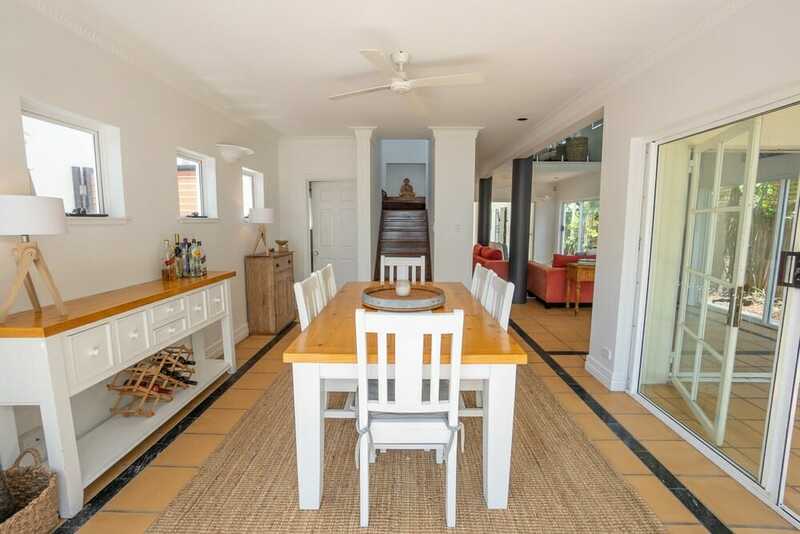 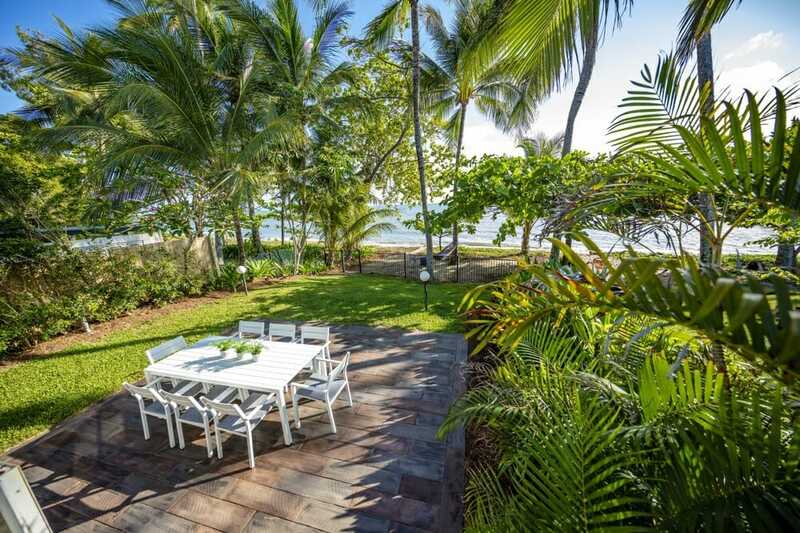 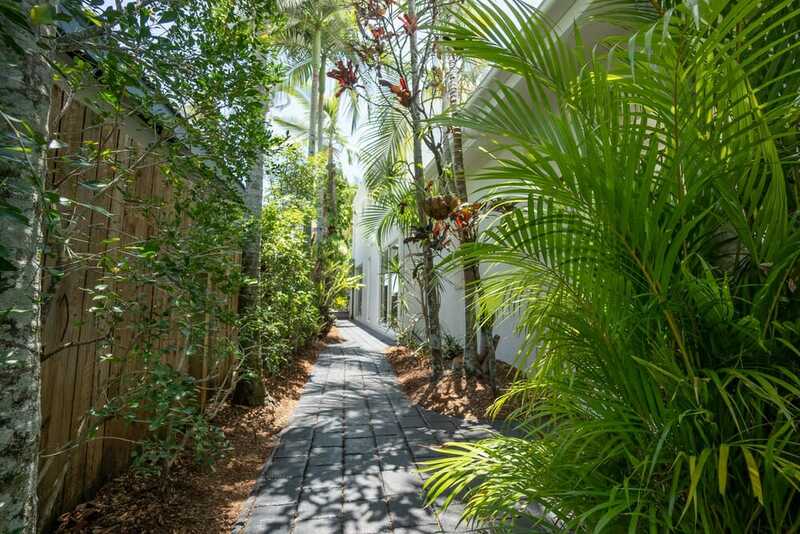 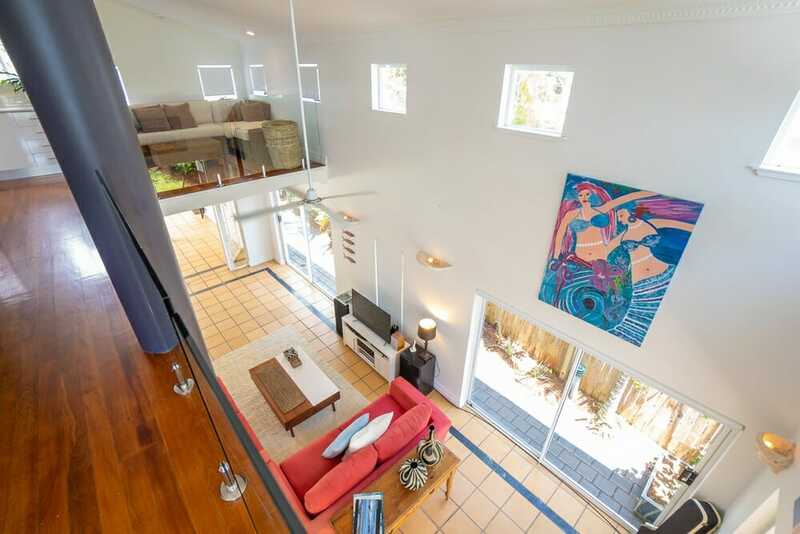 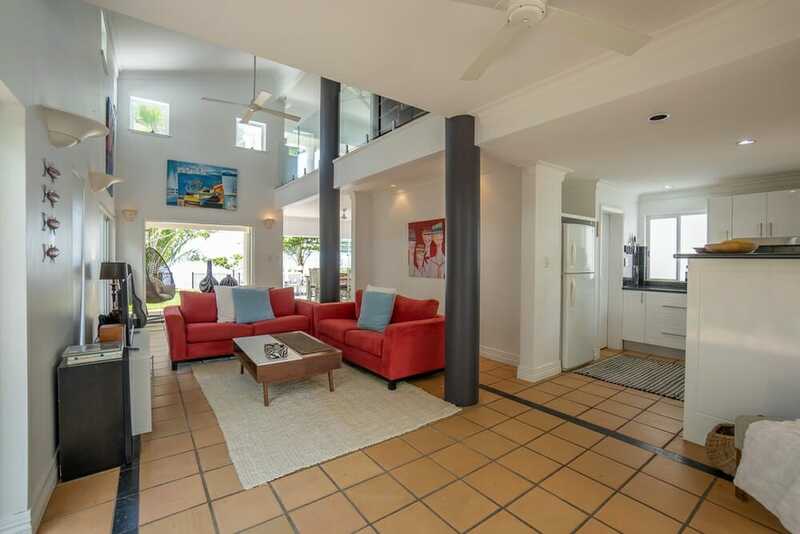 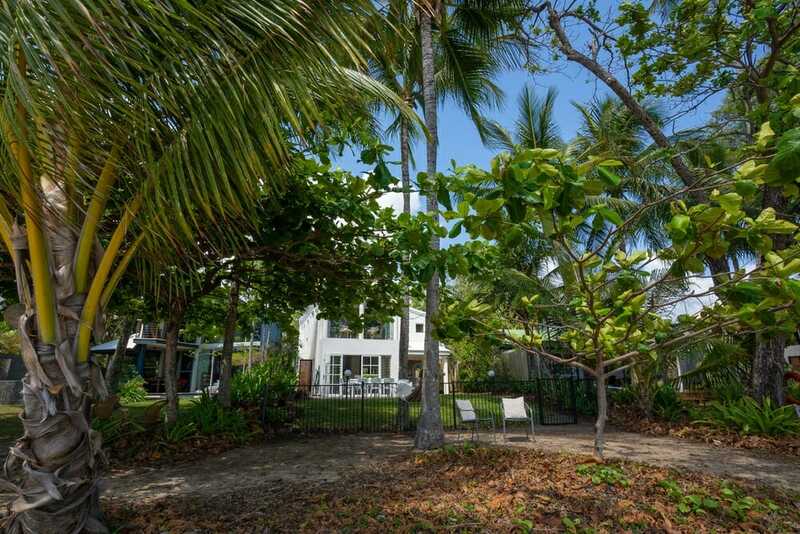 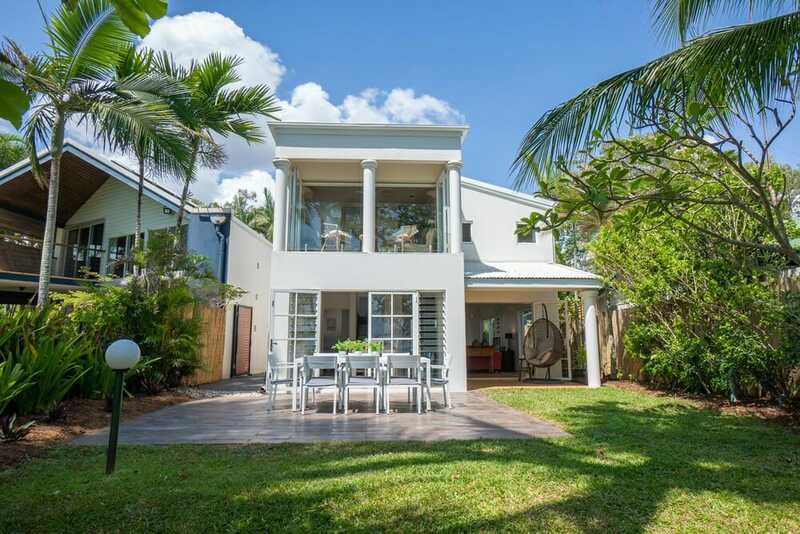 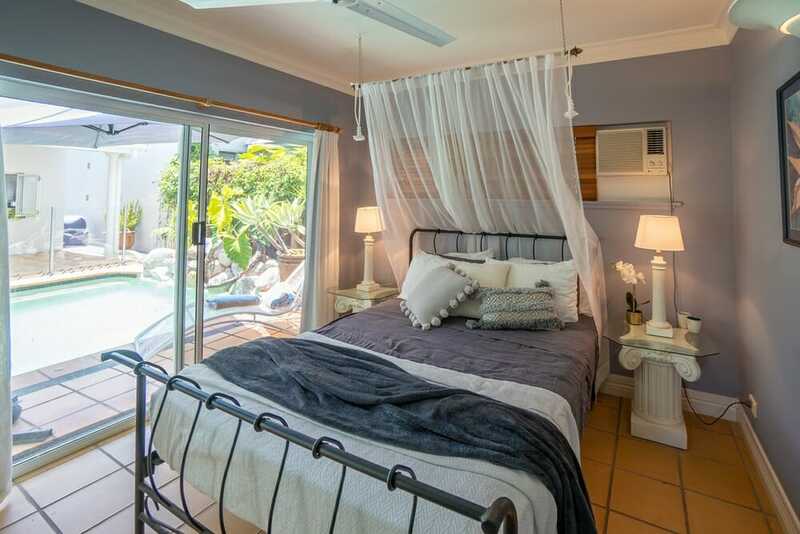 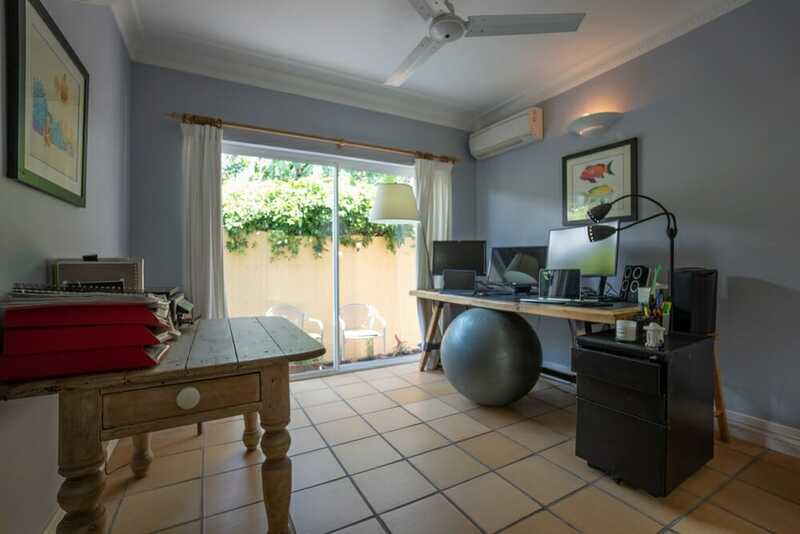 The house has a gorgeous, manageable garden which rolls down to meet the warm sand on Holloways Beach. 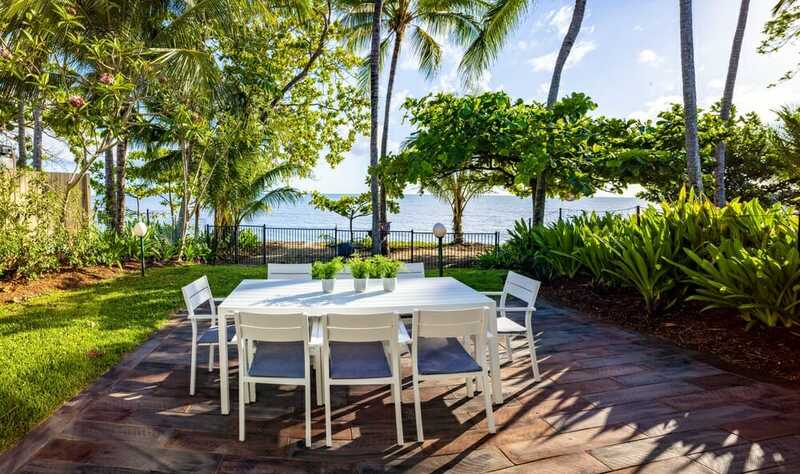 A main feature of the garden is the large paved deck leading off the dining room, perfect for a garden lunch party or evening BBQ. 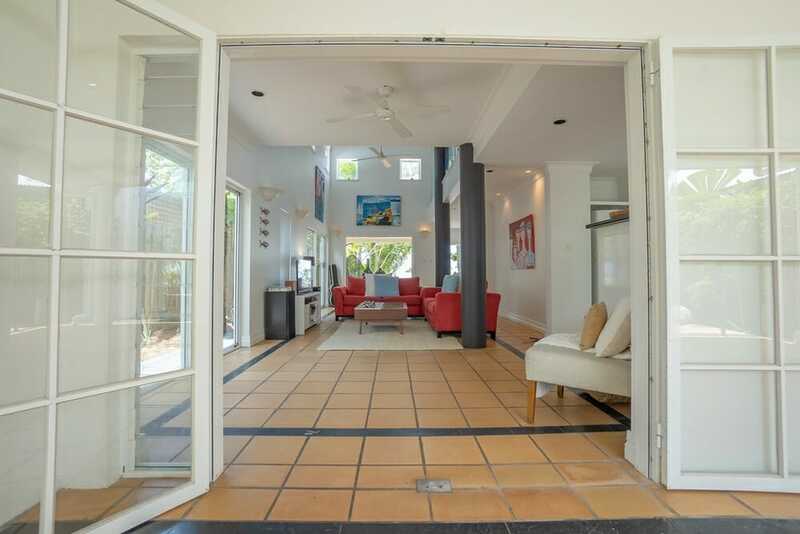 And there’s an additional shaded patio off the living room. 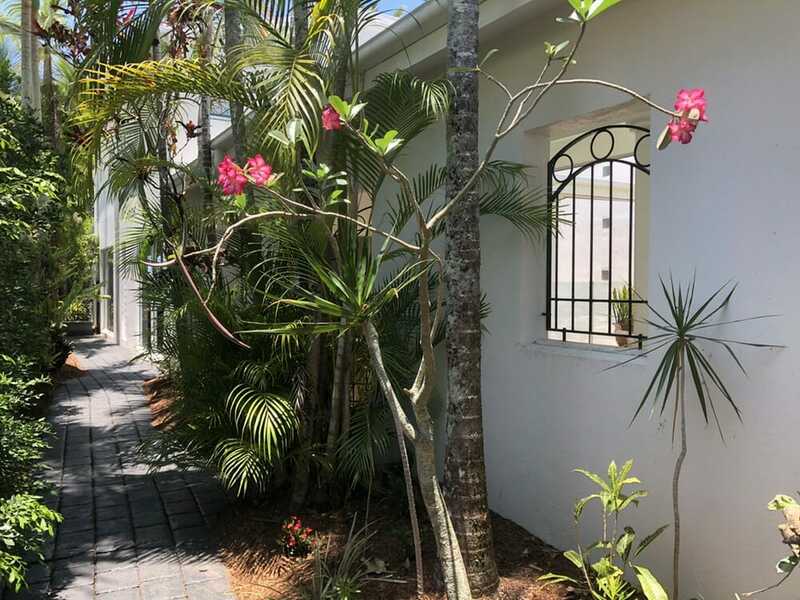 Swaying coconut palms, white Spider Lilies, Frangipani trees and blooming Hibiscus are just some of the easy-maintenance, topical plants growing in and around the garden. 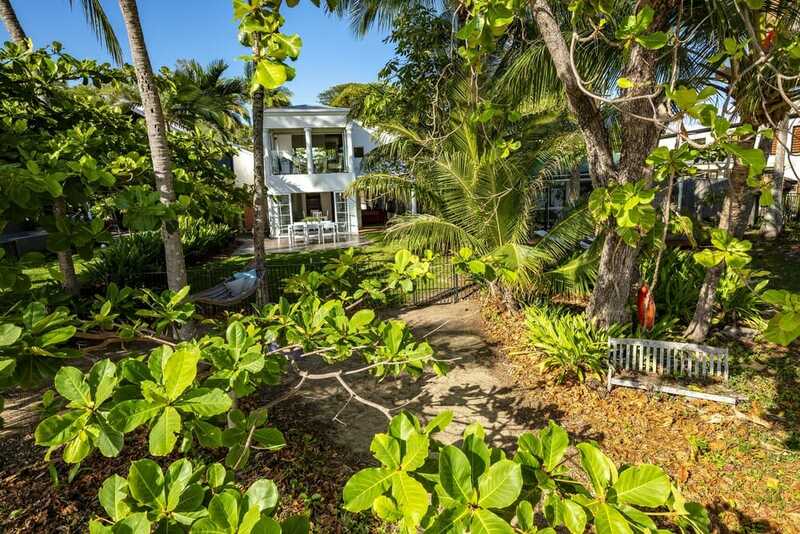 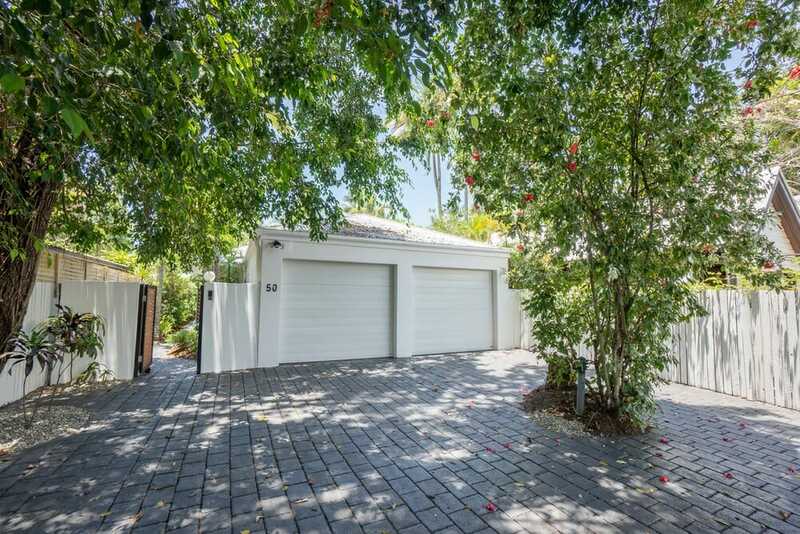 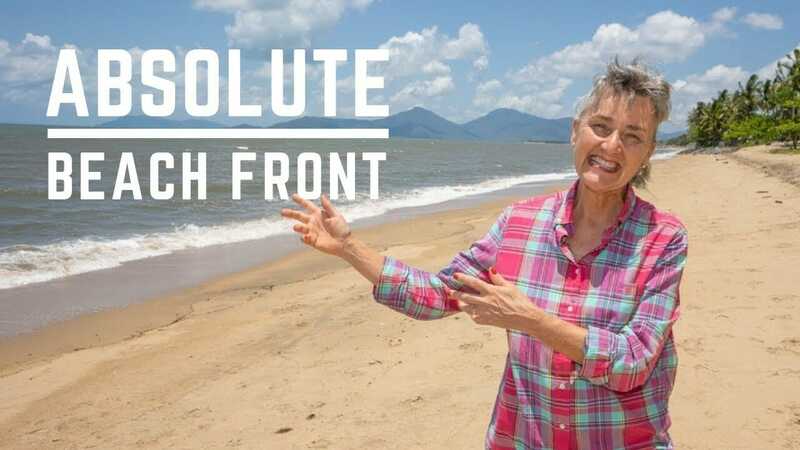 Call today for private inspection on this truely unique beachside residence.